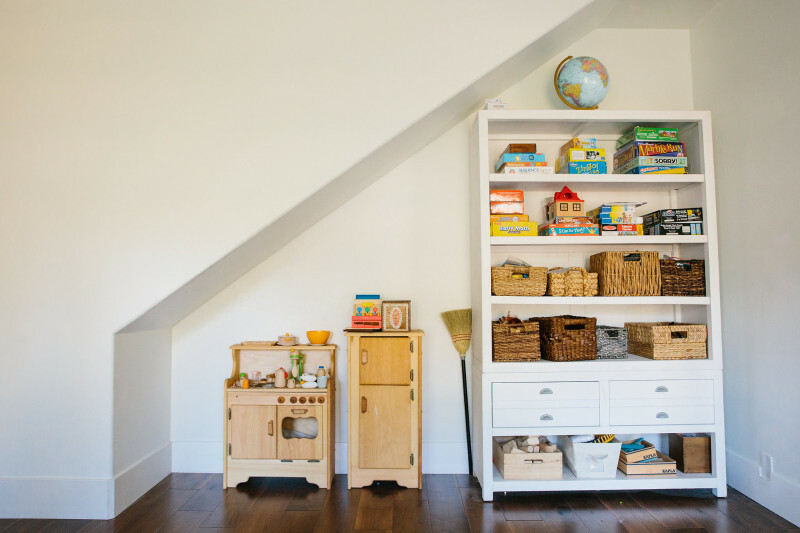 This tour of Elle Rowley’s stunning San Diego home (that playroom! that swing! 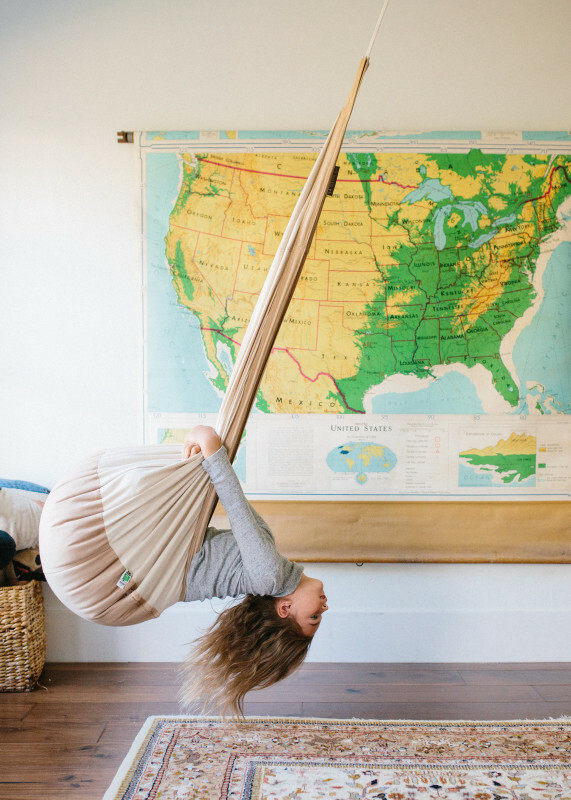 ), might spark instant mom envy, but after reading her incredibly inspiring story, you’ll soon realize she and her family deserve every bit of this seemingly fairytale life. 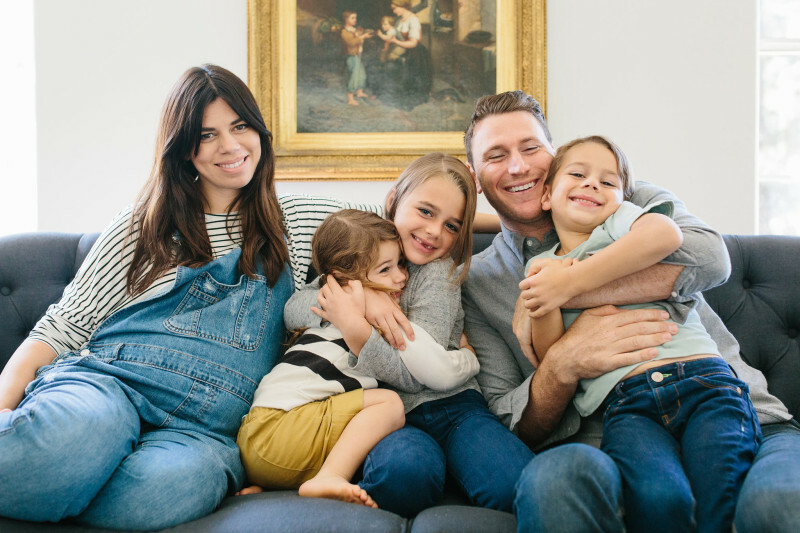 The hardworking founder of chic baby wrap company Solly Baby, as well as the co-founder of incredibly cool kids’ line ARQ, Rowley candidly discusses the juggle of two businesses while raising three kids (Lucy, 7, Solomon, 5, and Frances, 2), plus one on the way! Calling her “Superwoman” might be an understatement. "We live on just under an acre on the north end of San Diego County in an agricultural pocket about 15 minutes from the beach. It’s a hodgepodge neighborhood with a lot of greenhouses, random plots of land, and shacks and mansions all kind of thrown together. We like it because, as much as we love the city and the beach, we like having room to breathe more. We moved back to San Diego last spring after renovating an Oregon farmhouse on ten acres the previous nine months. I am currently a tired, old pregnant lady who is sick of moving, so I let my husband, Jared, take the reins on just about every detail in this house. Turns out I should’ve handed those reins over years ago." Elle wears maternity overalls and a striped shirt from Topshop. Frances wears a striped raglan sweatshirt and mid-length skirt from ARQ. Lucy wears Zara. 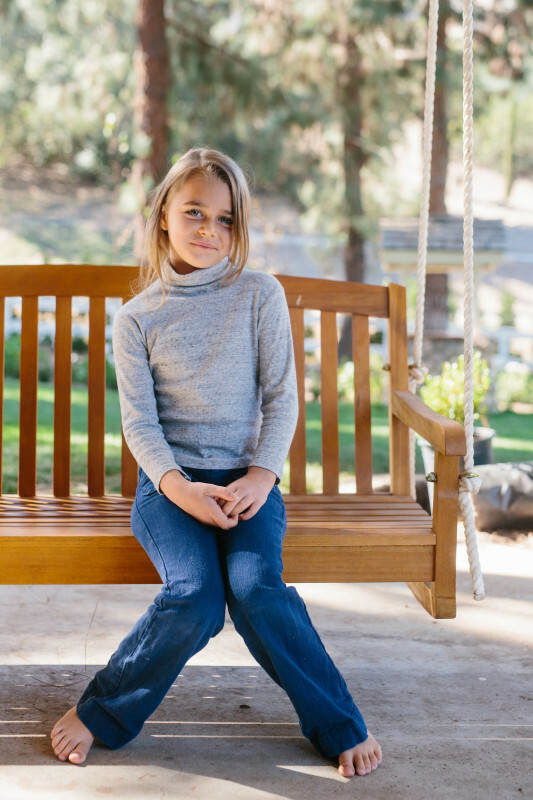 Solomon wears a top by Boy + Girl and jeans by Mini Boden. Jared wears a Frank & Oak top. "Sunshine, nice people, and the beach. 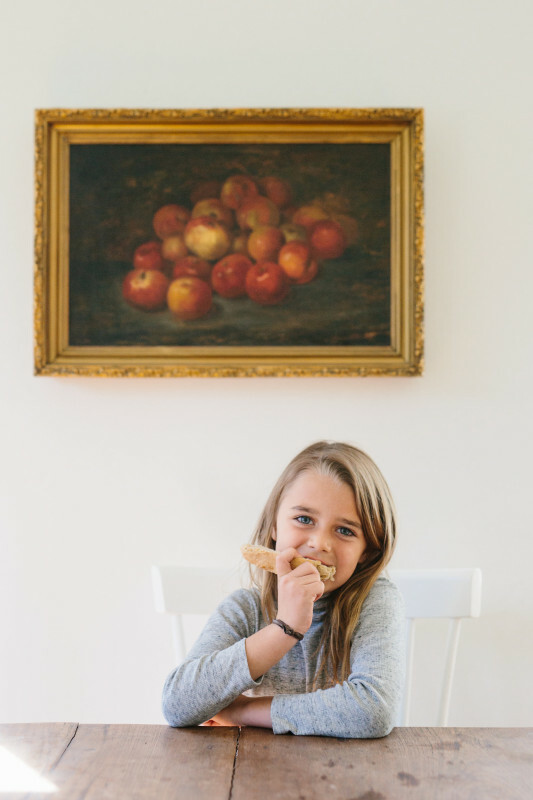 I have pretty much constant wanderlust, but I like having a home base and I’ve finally recognized how good it is for our kids to have consistency. 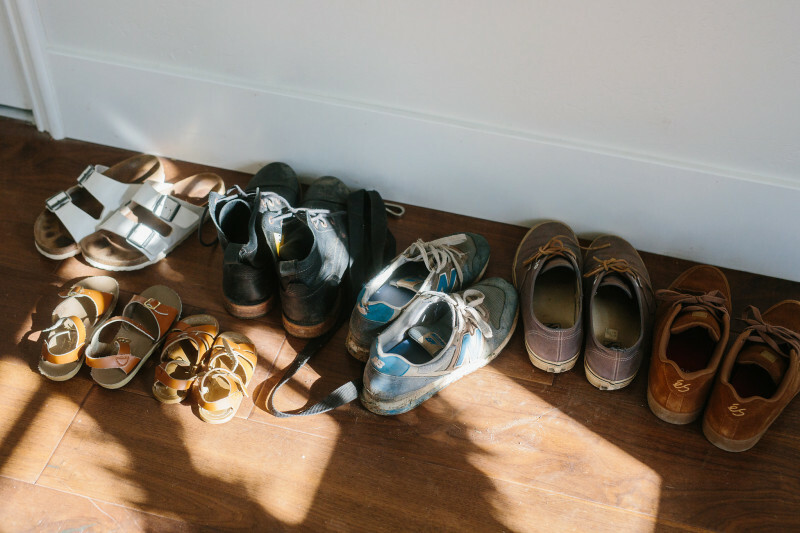 We kept our farmhouse in Oregon to help curb my almost insatiable need for frequent change." 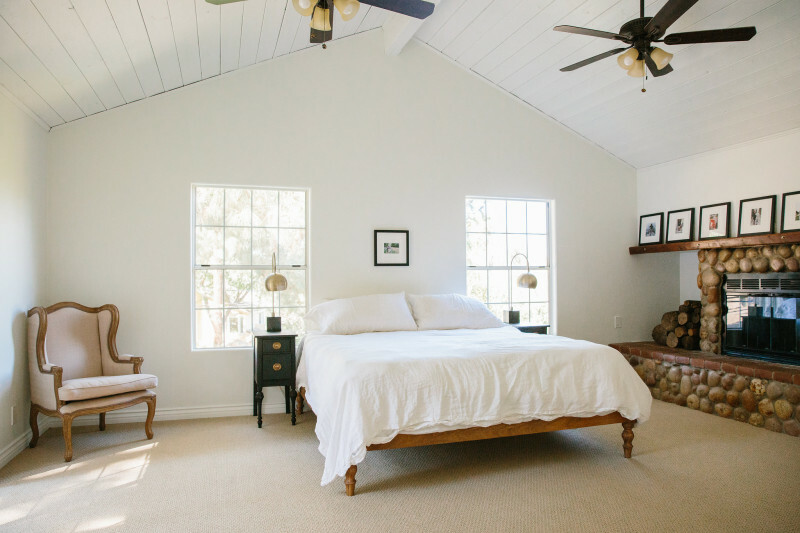 "I guess I would say it’s a minimalist, slightly modern approach to French-country. Is that even a thing? 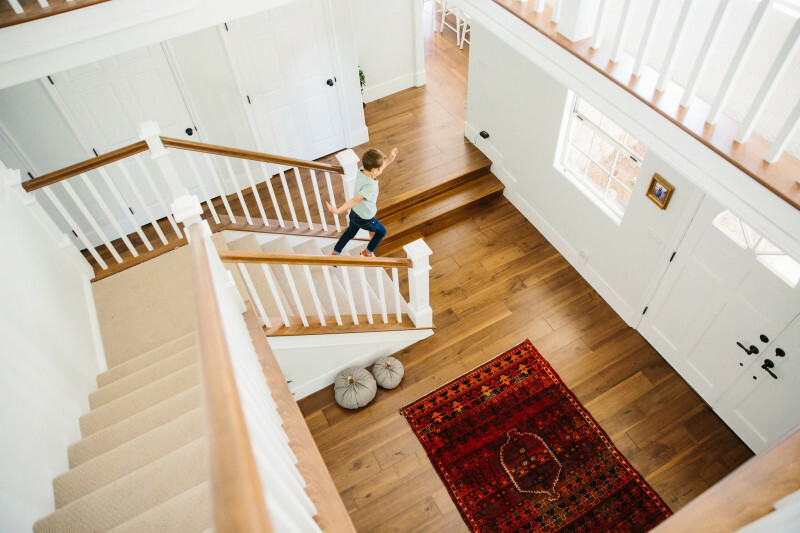 We love the clean lines and open space that comes with modern design, but the structure of this home is warm with small, inviting spaces and we wanted to stay true to that." "I’ve never understood what it means to decorate. It seemed like this mysterious thing going on that other women learned growing up and I missed out on, which I’ve always assumed is because I grew up poor and unrefined. This concerned me when I was first married, but I quickly gave up and just decided to buy things I really love. 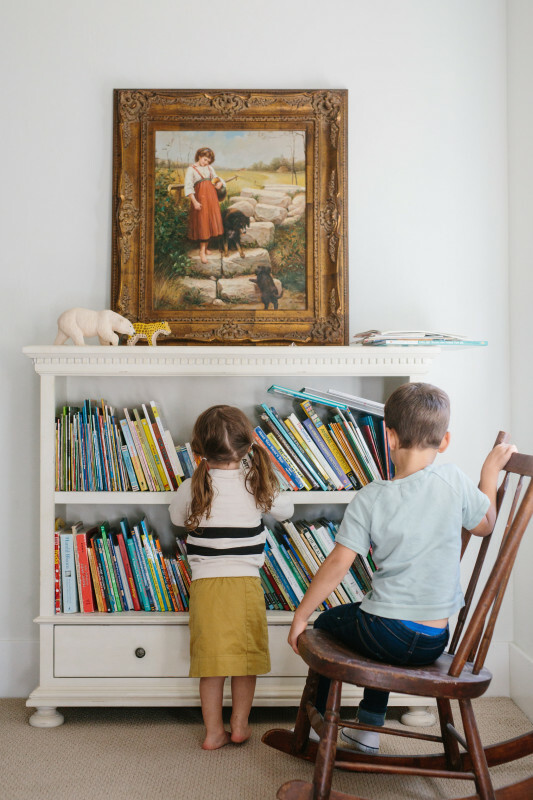 Jared and I love art, old books, plants, and a few antiques that hold personal meaning, so that’s what we work with. 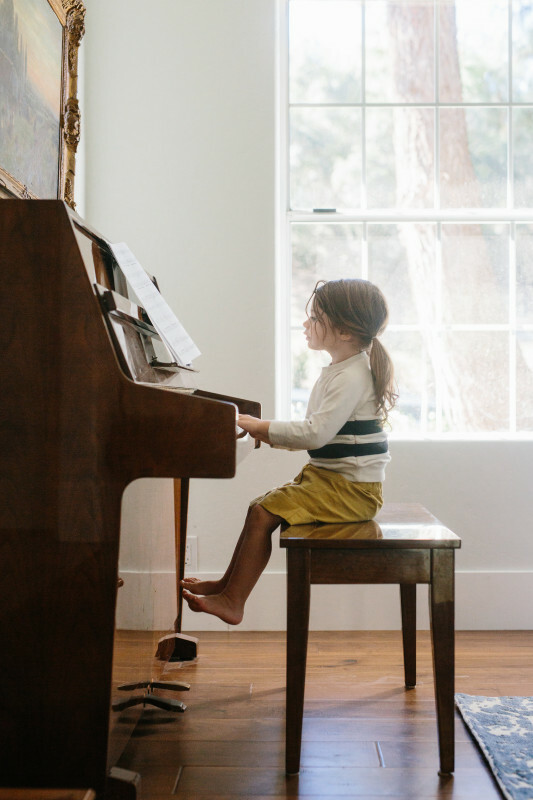 Part of the philosophy behind French-country design is passing down to the next generation, which we love because we are all about nostalgia and things made to last." "Jared is a master at finding killer deals on original art on eBay. My favorite piece he’s found recently is of a peasant mother and her children above the sofa in our living room. It’s dark and moody but tells a beautiful story of family. We also have an 18th century French farmhouse dining table that I’m obsessed with. 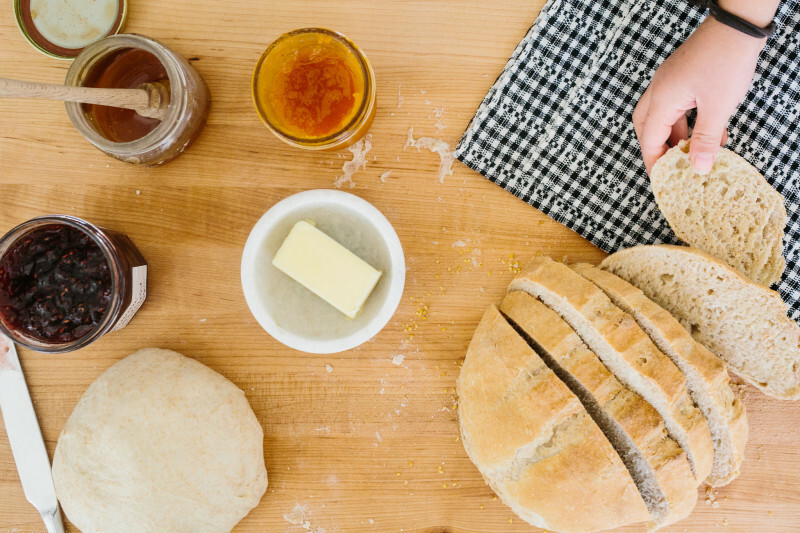 I love thinking of all the meals shared across it." 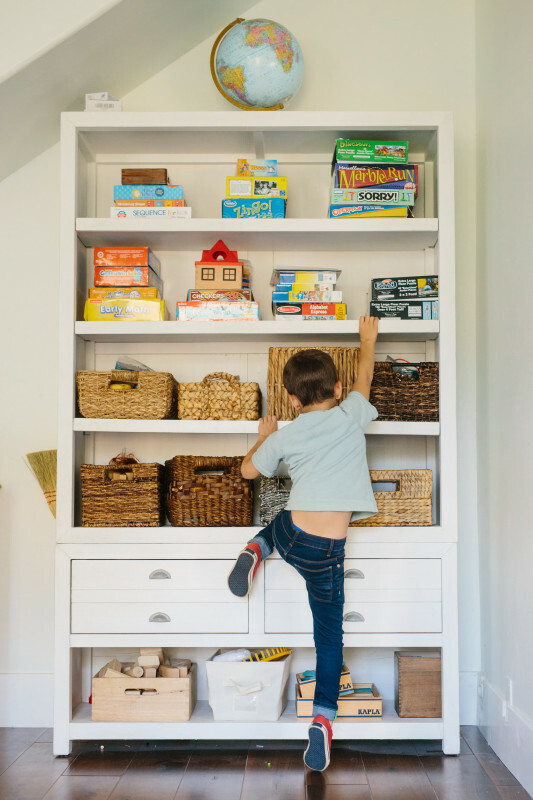 "Now that we finally have a playroom, we are a little nuts about keeping the toys in there. 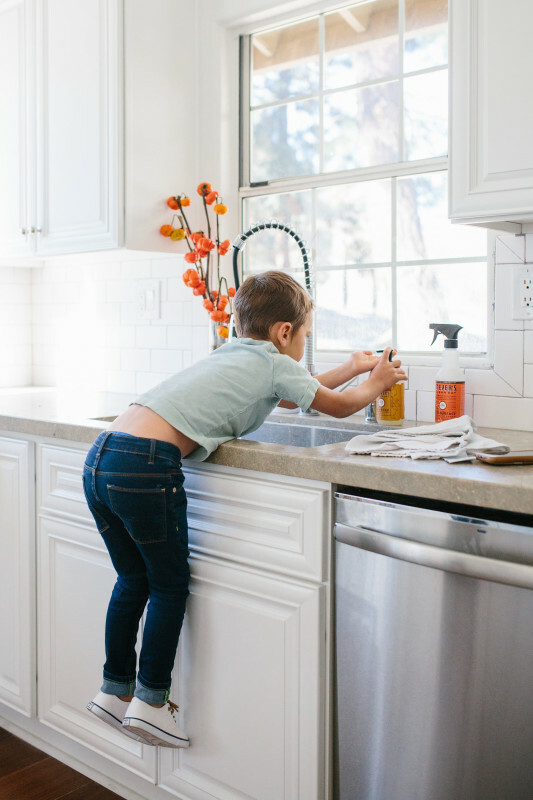 We clean it once a week and the rest of the home stays pretty clean because of it. I’m sure this will all fall apart when we have this fourth baby, but for now it’s worked nicely." "I love that they’ll have each other. 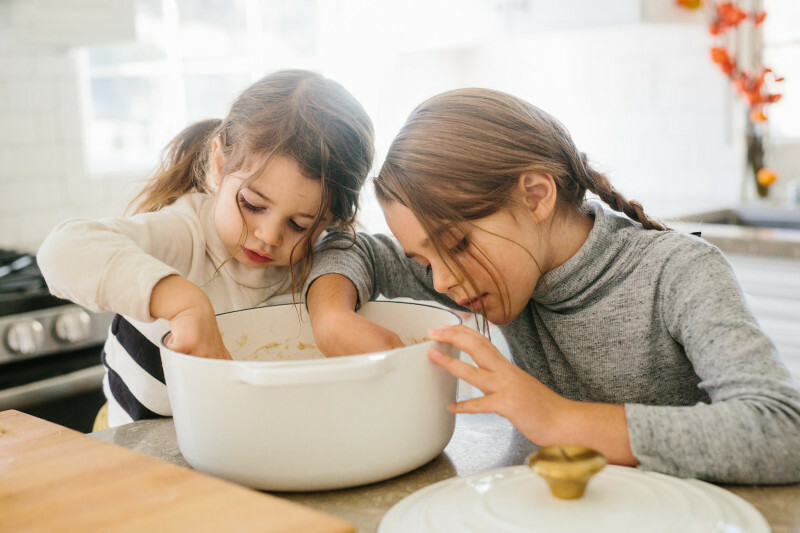 There’s a lot of security that comes with having siblings and generally a strong sense of belonging, so I’m excited to see those dynamics unfold. I also love being a parent with my husband. He makes everything fun and meaningful. With every baby I love him more and more. I’m the youngest of seven children in ten years and although it was Lord of the Flies crazy for most of my childhood, I am incredibly grateful to have so many amazing brothers and sisters to lean on and to learn from. Still, that did not inspire me to have a fourth. Honestly, I still can’t believe this is happening! Best and biggest surprise ever." "A girl! Only Solomon was been bummed about another girl, but he’s come around. For the first three months he kept complaining/genuinely crying about how 'there are already too many girls on the planet.'" "It’s only been two and a half years since my last, but I feel thirty years older this time around! Everything feels a bit harder, but knowing it’s my last has given me the endurance I’ve needed." "As excited as we are for #4, I’m pretty sure immaculate conception is the only way that would happen." 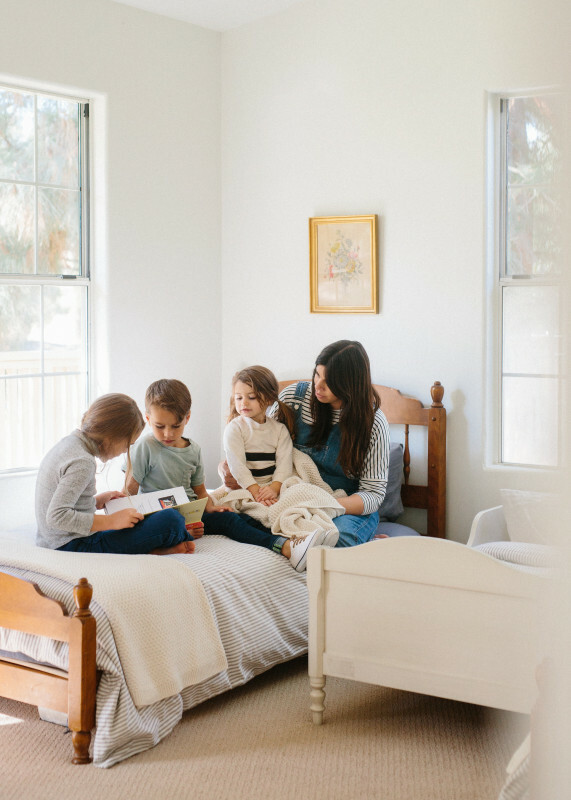 "We have all three of our little ones share a room, even though we have empty bedrooms in this home. I think it’s my silent revolt against everything else in their world telling them they should have everything of their own. I’m sure we’ll eventually spread them out, but I’m holding onto these last few years of fitting three beds in one room and kneeling at the end of Frances’ toddler bed so I can reach each of them at the same time and watching each one slowly drift away while we read stories at night. We also have a little reading nook right outside of their room with all of their books. It’s still a work in progress, but I’ve been pleasantly surprised by how often I’ll find them there, quietly going through books on their own. 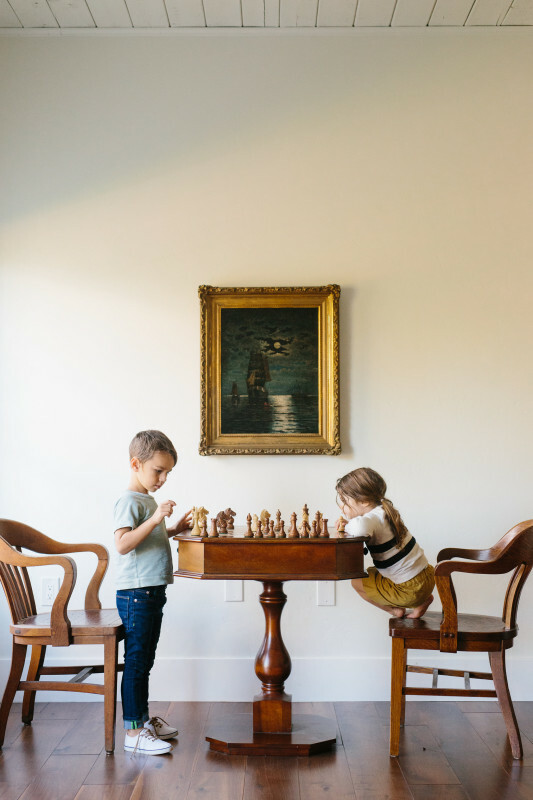 It’s been so much better than having them mixed in their playroom." 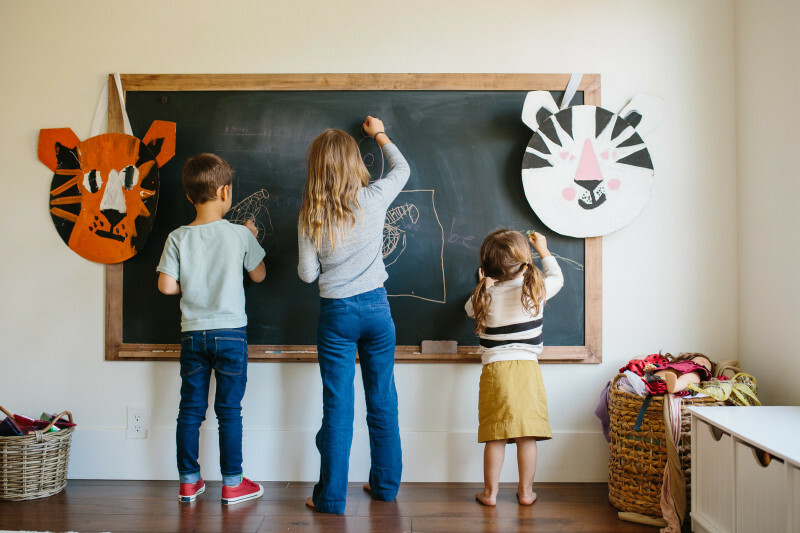 "We have an old schoolhouse clock in their room that’s helped them learn to tell the time and a shelf with their favorite treasures from the ocean and our travels. Those are my favorite pieces, but functionally I love having a separate hamper for each of them in their room. Makes doing the laundry so much easier!" "Seeing my children learn something new." "Seeing how quickly time passes. In general, I mean. Some days it passes way. too. slowly." "I know very few mothers who don’t impress me for one reason or another. I reject the notion that there are good moms and bad moms. There are good and bad drivers, good and bad hair stylists, dentists, even friends, and just about everything else, but those polars don’t really work when it comes to mothers, at least not any of the mothers I know. 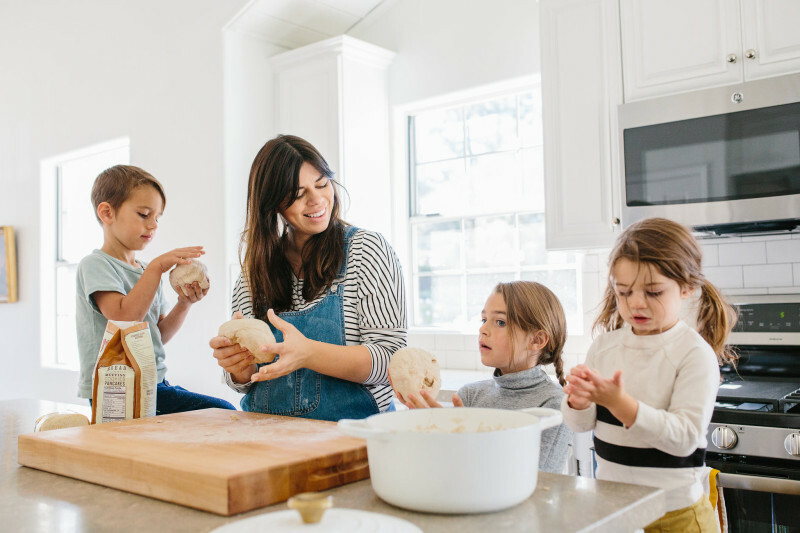 Every mom I know is doing the best she can and that is inspiring." "I had a rather tumultuous upbringing, so in my haste to leave it behind me, I always thought I would reject it all and start fresh, but as I’ve gotten older and have not only seen my own weaknesses as a parent but also understood just how hard the whole business of raising children is, I’ve grown to appreciate and recognize the good and I’m doing my best to forget/not repeat the bad. My mother was a single mom to all seven of us at one point, so that pretty much makes her a saint just for surviving it, and she’s always been very loving. She still calls each of us a 'precious angel' in casual conversation, not just when she’s being sweet." 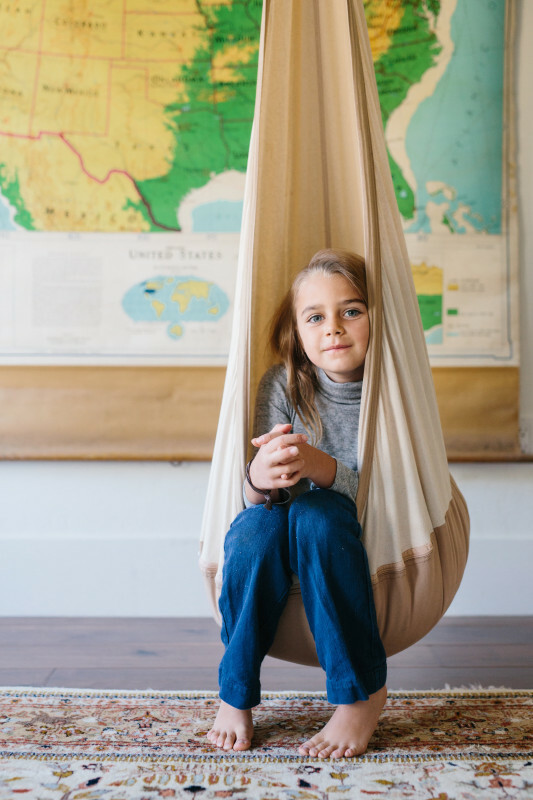 "Simplicity Parenting is my favorite parenting book that I’ve read. 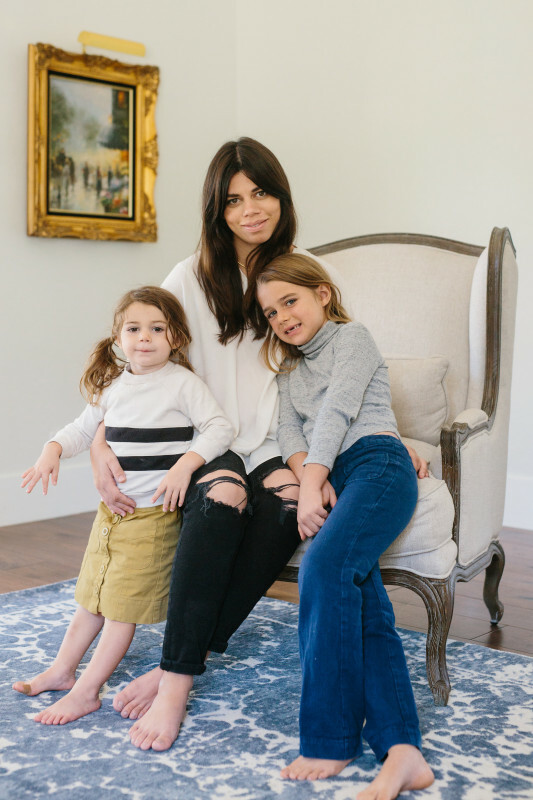 I used to consume parenting books like some women consume fashion magazines, but I’ve slowed down in recent years in an attempt to listen to my own rhythm as a mother." "Lucy Mack, Solomon Hancock, and Frances Pearl. They are all family names and they each have special stories that have been passed down through the generations. Jared and I have always loved the idea of giving our kids names that would give them a sense of belonging and something to honor." 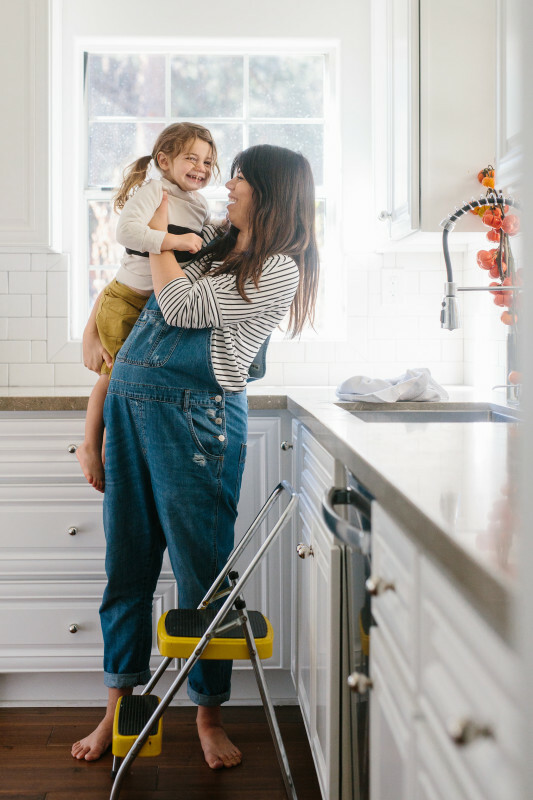 "It’s really easy to feel like you have something to prove to other people about the 'kind of mom you are' and maybe even yourself with that first one, but you don’t. You are worthy and you are good and you are meant for that little one and that little one is meant for you, no matter how it came to be." "Not taking score, date night, looking for the best in your partner, and caring about their needs being met as much as your own." 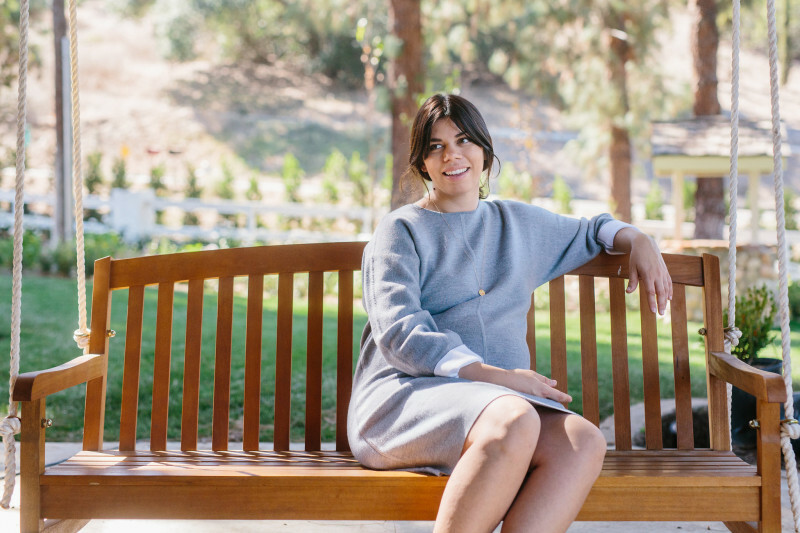 "I’m the founder and CEO of Solly Baby, a luxury baby carrier company and co-founder of ARQ, a high-end, ethically made children’s clothing company. 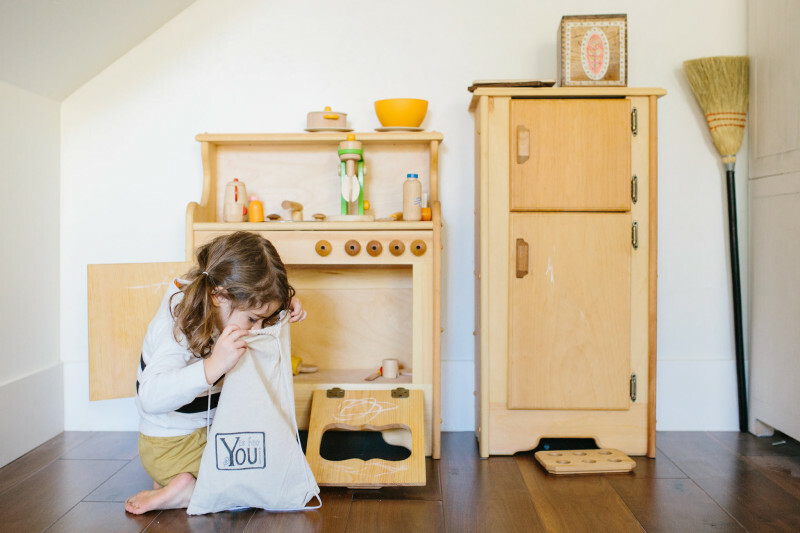 Solly Baby is still very much my focus and it will always be my baby, but ARQ is a really satisfying space for me to explore creatively that helps keep both businesses very fresh for me. Thankfully Solly Baby is at a point that we have a small team that makes everything happen, putting me in much more of a director role rather than executor, and Abigail really runs the day-to-day at ARQ. We have also made really deliberate decisions with both business models to make sure they are scaleable in a way that doesn’t equal our lives being taken over by operations. That’s been huge for us and actually affords us an, overall, rather flexible schedule with a lot of time for family." "After using migraine-inducing carriers that left me feeling like a packhorse with my first baby, I wanted something comfortable and chic to wear with my second baby, Solomon (we also call him 'Solly,' hence the name Solly Baby), so I could not only best take care of his needs, but also chase after my toddler. 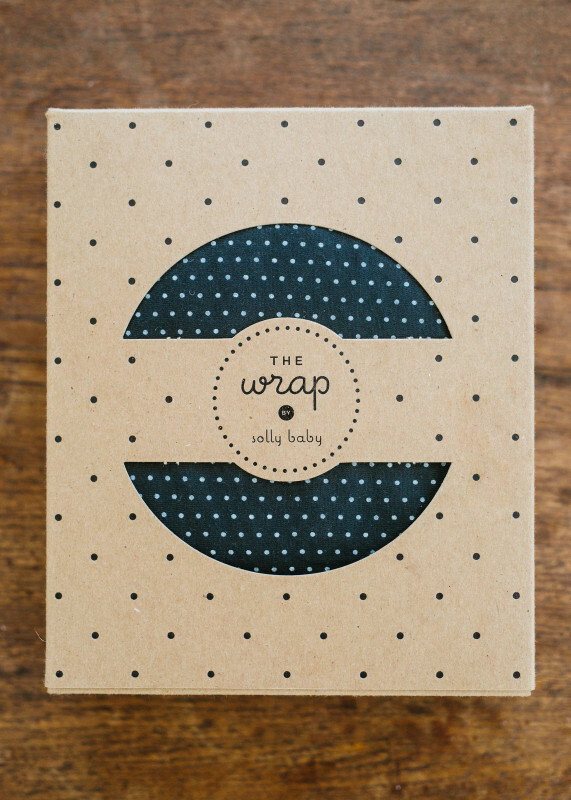 So, I made my first wrap. I fell in love with the experience right away and started making them for friends. Having never used another wrap, I honestly didn’t know I’d done anything different than other wraps on the market, but friends and family quickly told me I had, that mine was much lighter weight, more comfortable, and looked so good that it made it fun to wear. I turned it into an Etsy shop and grew it from there through social media with Jared coming on board a couple of years in and saving my sanity. I’m forever grateful to the early adopters and their sweet babies. That was a difficult time for our family and every image and blog post from these women equaled food on our table. 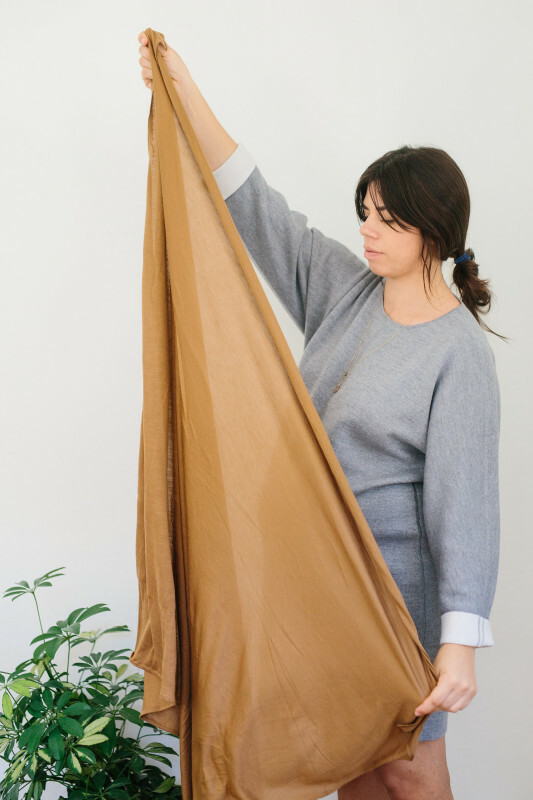 ARQ began just two years ago when my brother’s wife, Abigail, an art school grad and self-taught seamstress who’d spent years making her family’s wardrobe, announced after almost a decade and three kids, that the time had finally come. I’d told her for years that whenever she was ready to create a clothing line I’d be ready to help in any way and I meant it. She’s truly a designer from conception all the way to the finishing stages of production and messaging behind each collection and the brand. I am so honored to be a small part in that process." "I spent half of my childhood in Southeast Texas, some in Houston and some in a tiny town with an alligator-filled swamp in our backyard and the KKK holding meetings a town over. It was there that my parents divorced after 23 years and we then moved with my mom to Utah to be closer to her sisters for support and a new start. 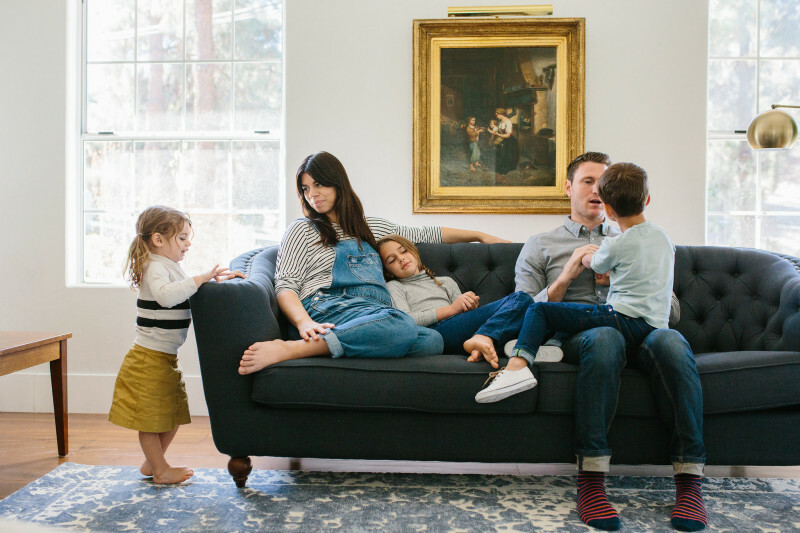 I lived there through college, where I fell in love and married Jared, graduated with a degree from Southern Utah University in English Literature and Communications, and we had our first two babies. I worked with some independent filmmakers through school, but really didn’t have too much 'real work' experience before starting Solly Baby. 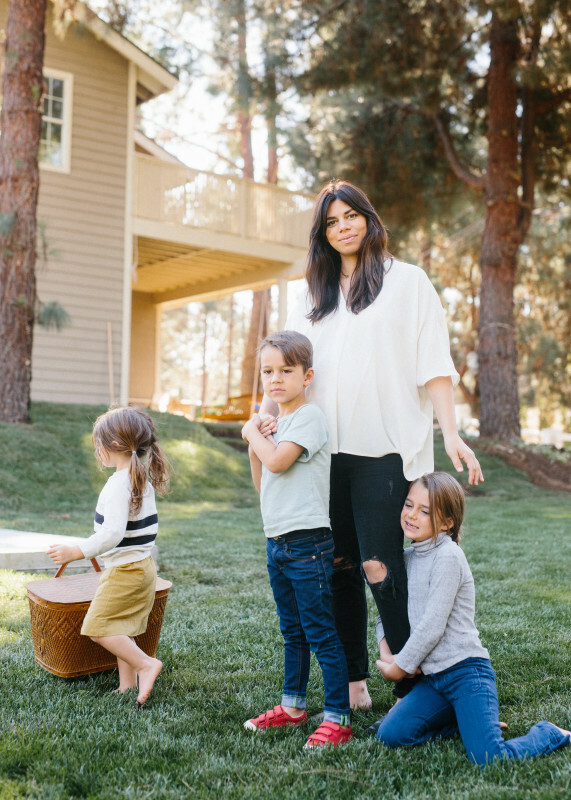 Jared and his family are very entrepreneurial-minded and so that led to my quest to start a business I was passionate about and that would give me the freedom to still be at home with my babies. We stayed in Utah until Jared finished his degree from the University of Utah in Salt Lake City and then, as he tried to figure out what he wanted to do and we saved money to keep Solly Baby afloat, we sold everything and moved in with his parents in California. That was a rough period as we were both a little lost at the time, but a year later we made it through the worst and I talked Jared into working with me full-time. 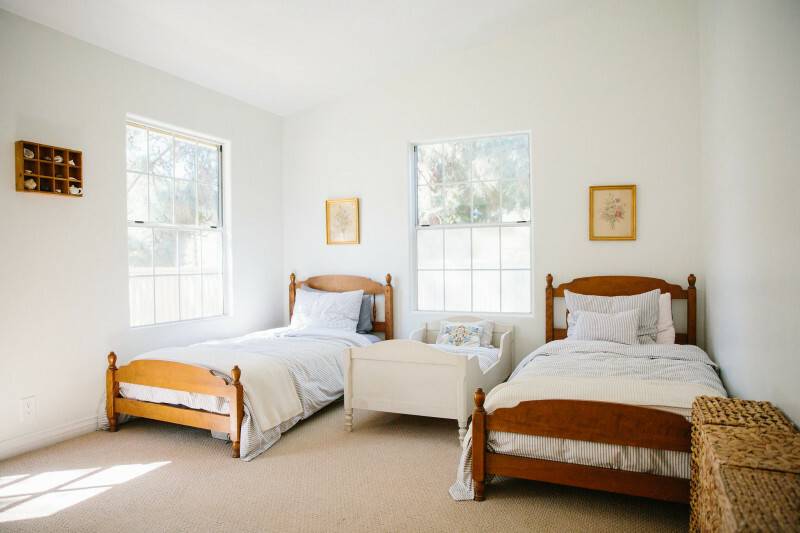 From there we moved into a little 640-square-foot home by the beach and worked our hearts out on Solly Baby. Seven years of marriage, two babies, and two years into Solly Baby, finally, it felt like we’d arrived." 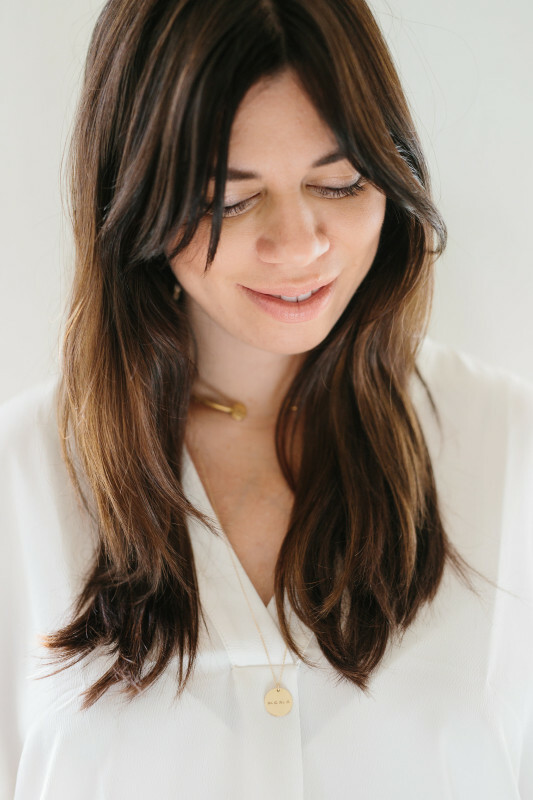 Elle wears an Everlane dress and an Odette necklace. "I think it continually changes as they hit different phases. I could easily be a workaholic, but time has taught me that nothing is as important as they are." "Absolutely. It’s made me realize that time is everything and it should never be wasted on things you don’t really care about. We often say no to what others would consider 'big opportunities,' because they aren’t things that we are passionate about." "Although it technically doesn’t exist since the buck stops with me, so to speak, I’m hoping I’ll be able to take at least the first month nice and slow. With Frances, our third, I worked in the hospital while I was in labor and right after having her, but this time I’m hoping we’ve planned well enough that my work each day will only involve what I want it to. Jared is an amazing support in every way, so that makes things much easier. 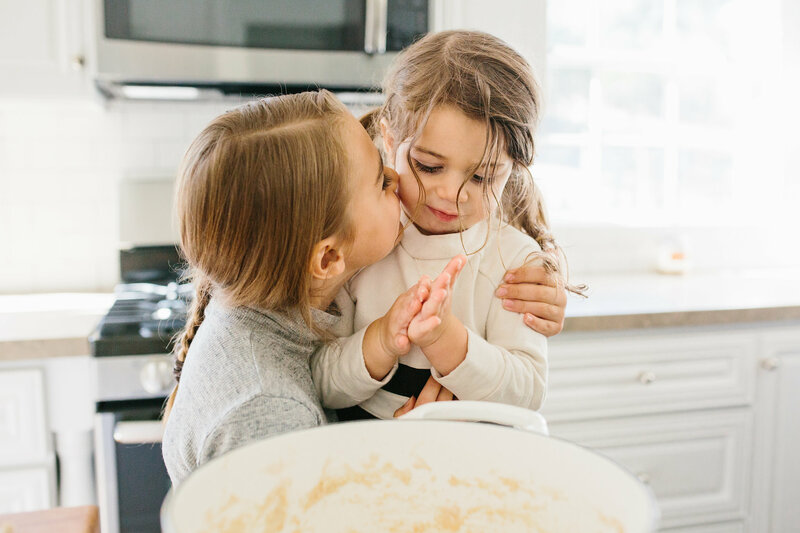 Our line of work focuses on the first six months postpartum, and having a baby is a natural time for me to connect with our product in a very genuine way and to share that experience with our community. 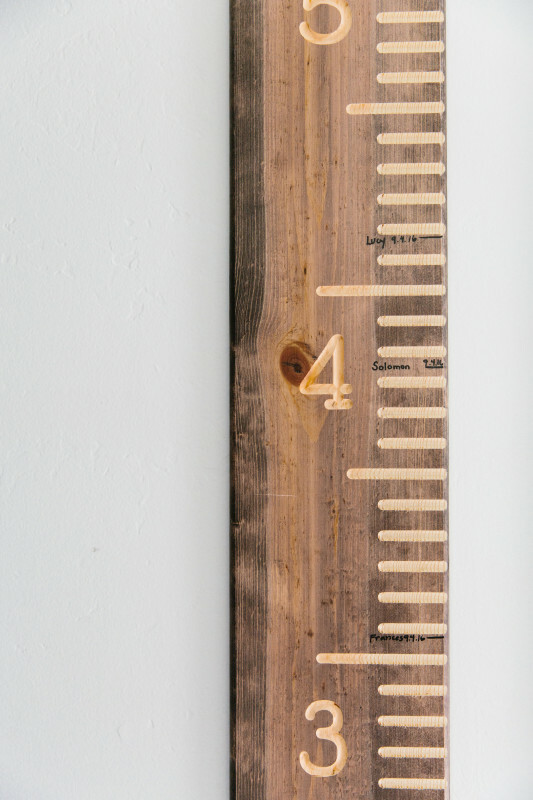 It’s my favorite thing about our business, but also the most draining aspect at times." "Between my mom having six other children and working a lot when I was growing up, I missed her terribly. As Solly Baby has grown and threatened to require everything of me at times, I have done my best to make sure my family’s needs are being met first. I can accept having regrets about my professional life, but not my family life. 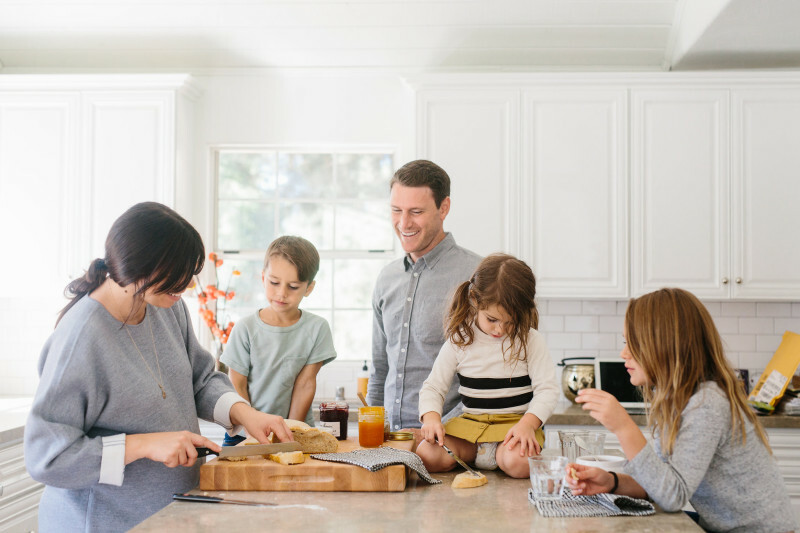 Jared and I have worked hard to create a lifestyle that allows for the both of us to have a lot of hands-on time with our kids and plenty of guilt-free working time, as well." 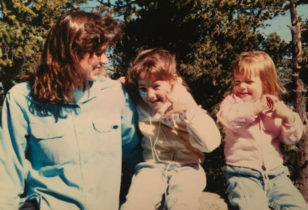 "I was riddled with 'mom guilt' for years. I finally realized how much of it was culturally and socially induced, which is obviously garbage, and decided to only surround myself with people who really love and support me and our family." 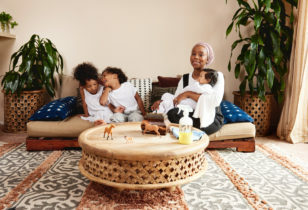 "Connecting with other women and seeing how our products at Solly Baby make the lives of caregivers easier and more meaningful. In the future, I’d like to write a book, but that feels scarier than running a business to me, so we’ll see how long it takes me to get there." "Simple, understated, casual, and the fit being the most important thing...besides right now when nothing fits! Before becoming a mother, I used to love vintage clothing, making my own clothing, and, in general, I was much more adventurous. I don’t have the time to sift through thrift store racks anymore and much less time to sew my own clothing, but I love finding small, responsibly made brands to support. That has been more challenging this pregnancy, so when I find good brands I love spreading the word." Elle wears Topshop jeans and a Hatch top. 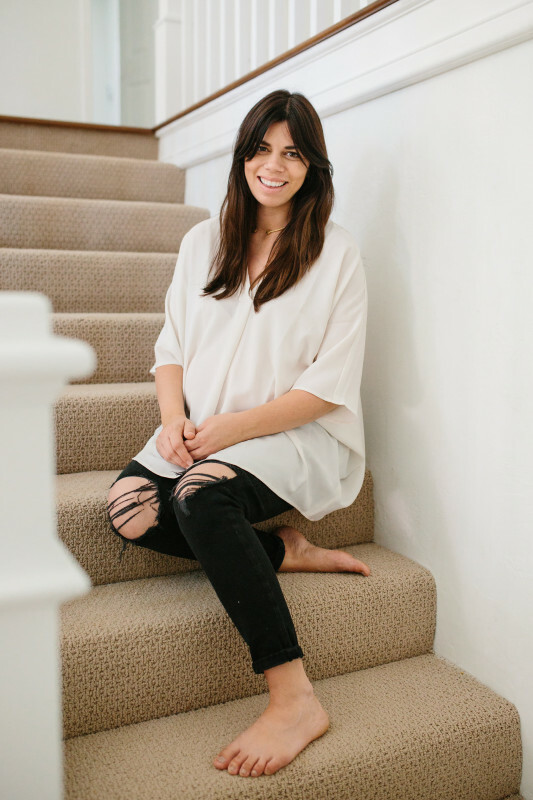 "This pregnancy I’ve loved my Current/Elliot x Hatch maternity jeans and oversized tees that I can run around all day in but easily throw a sweater over and a clog or mule with to wear for a meeting or event. Also, all of my Storq dresses have been essentials this time around. As for designers, I love Everlane, Christy Dawn, Doen, First Rite, Rachel Craven, Rachel Comey, Ace & Jig, and Mimu Maxi. They each have a beautiful, unique aesthetic, they’re all transparent companies, almost all run by women, and they have a lot of intent and thought behind their designs. The things we buy tell a story about us and I like buying into their stories. 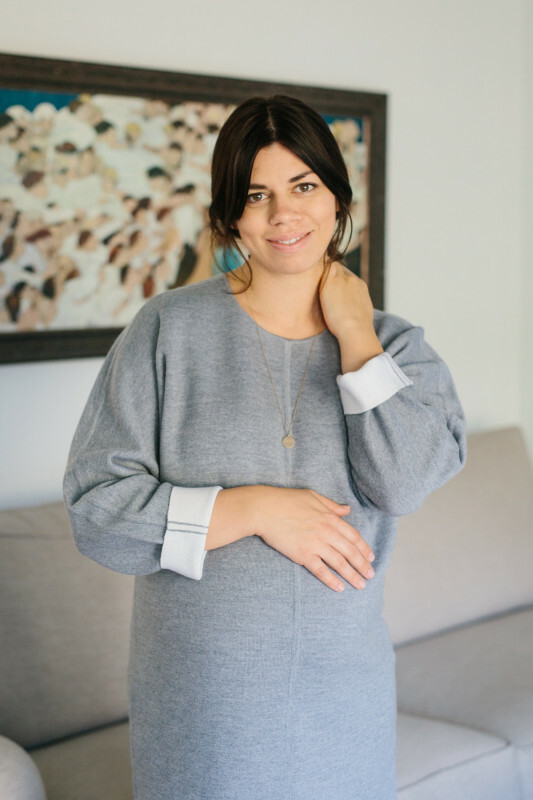 My favorite maternity pieces are from Storq, Hatch, Topshop, and Jared’s closet!" "Fast! Dr. Bronner’s soap and coconut oil. My skin is incredibly sensitive and most soaps and lotions irritate it. Taking fish oil every day is essential for me to protect against breakouts. Tarte makeup is my favorite because the ingredients are so clean I can wear a lot, when needed, without it bothering my skin. I’ve loved Tubby Todd’s new Mama line for the rest of my body." "I’m usually a yoga person, but right now I do Pilates in the morning because it’s helped so much with aches and pains and I consider myself a pretty spiritual person, or at least I try to be, so I make sure I pray each day and that we pray as a family, as well." "Mostly online, which means I have way too many things in my closet that don’t fit quite right because I’m terrible at returning things! Drives my husband bonkers." "There are plenty of great spots downtown, but I prefer Encinitas, a beach town nearby. Everything is right by the beach, which is stunning there, and there is so much good food. East Asian Village Diner, Taco Stand, Darshan’s Bakery, Haggo’s Organic Taco, and French Corner are my favorite spots for eating and hanging out." For more on Elle and her beautiful brood, find her on Instagram here and here.